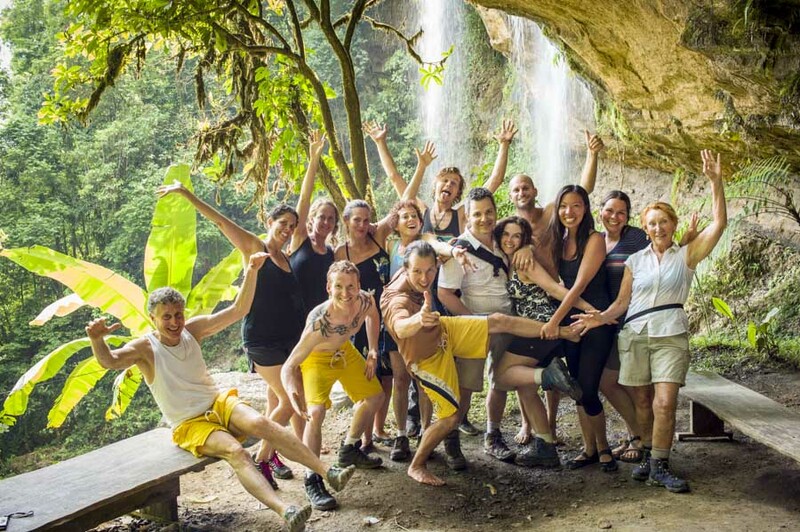 Come join SOME other “Health Raisers” for a full week of AWESOME Raw Food, Fun & Healing Adventure in this AMAZING Costa Rica Wellness Retreat! 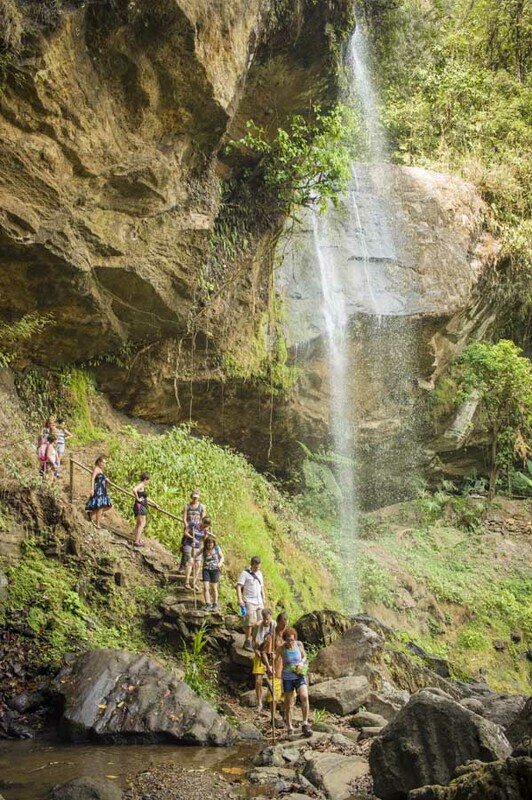 FUN and Challenging Jungle Hikes! TANTALIZING Fruits and other Delicious Tropical Food Delights! QIGONG, YOGA & CORRECTIVE EXERCISE Classes to Improve Posture & Overall Fitness! PRIVATE Individual Bodywork Sessions to Eliminate Chronic Pain & Dysfunction! TONS of Daily Action and ADVENTURE! HEALTHY Weight Loss and Detoxification! IMPROVED Strength, Flexibility, and Overall Fitness! A Greater Sense of Being CONNECTED to Self, Others, and The Planet! If you want to experience a wellness retreat that is truly unique and that will leave you feeling recharged, rejuvenated, and regenerated, this is a MUST ATTEND event! To make sure this wellness retreat delivers a high-quality experience, it will be limited to just 15 people and some spaces have already been reserved! Register Today and come Have some FUN as You Transform your Health in Paradise! During this wellness retreat, you will explore breathtaking waterfalls; play on beautiful beaches; go on fun jungle hikes; tour awesome organic farms- including tasting wild fruits, plants, and other natural delights; fly through the jungle down zip-lines; possibly observe wild monkeys, toucans, and other exotic creatures in the jungle terrain; as well as experience other cool eco-adventures. You will leave this wellness retreat inspired and motivated to take better care of your health after hearing Dr. SAM speak about: raw food nutrition; exercise and fitness; optimizing the healing response; injury prevention; anti-aging; breathing; meditation and vibrational health; overall wellness; and spiritual enlightenment! 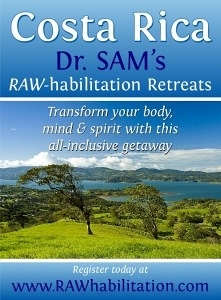 As a wellness retreat participant, you will receive at least 1 hr of private "RAW-habilitation Time" with Dr. SAM to meet your personal health and healing needs. Say goodbye to chronic aches and pains; and hello to a new vibrant body, mind, and spirit! Dr. SAM’s unique hands-on approach utilizes the body’s inherent wisdom to guide itself back into a balanced state of function. Customizing exercise to fit your body, mind, and spirit will be utilized in these private sessions as well as needed! During this wellness retreat, you will join others in group exercise sessions that will be aimed at improving movement; restoring flexibility and posture; toning muscle (especially your glutes and abs); improving your breathing; and fixing body imbalances that can help you prevent common injuries. These sessions will not only help you feel much better, they will also help to prepare you for some of the more challenging eco-adventures and other fun activities you may choose to participate in. Delicious and nutritious whole, natural, raw and living plant-based (vegan) foods will be served to you daily by our master chefs and kitchen staff. Your palate will be tantalized as you indulge in healthy meals that nourish every part of your being. Your mouth will water as you taste exotic fruits and other delights that you’ve never probably seen or heard of before. There will be fruit buffets; juices and smoothies; coconut water; as well as prepared lunches and various ethnic dinner cuisine meals that will pleasure your palate for sure! Dancing; Yoga, Qigong; Chanting and Singing; Creating Music and Art; Movies; Playing Games; Taking time to Relax, Reflect, and Meditate; and Sharing your Thoughts & Feelings as desired are just some of the FUN ways that will help you and others enjoy your stay during this wellness retreat. Who knows? You might even learn how to fly! “If you’re looking to have LOTS of FUN and learn how to take charge of your health, then attending one of Dr. SAM’s Wellness Retreats is a MUST!” I have attended several of his retreats; and they all have been amazing! 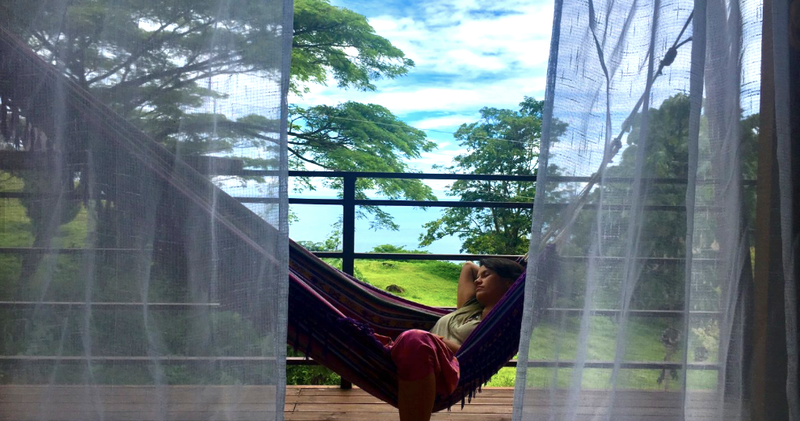 This wellness retreat event will be hosted at Casa Nautika, which is in the South Pacific region of Costa Rica. It’s located near the coast. This healthy-lifestyle-travel-destination sits enjoys pleasant temperatures, cool breezes, and outstanding views of the Pacific Ocean and evening sunsets. Please visit CasaNautika.com for more information about the resort. Natural cabin-style housing is available. Single beds and double beds may be an option. There is running water (hot and cold), showers, electricity, and flushing toilets. There is a common-area that has full kitchen facilities as well. Reservations of cabins are on a first-come basis for this wellness retreat. Pricing includes: accommodations for 7 nights and 7 full days, including a welcome dinner and goodbye breakfast. Each day, 3 meals of whole, natural, vegetarian raw and living foods (as well as snacks) will be provided during this wellness retreat. Please let us know if you have special dietary needs. Air travel is NOT included in the price of this wellness retreat, but travel to and from the airport to the retreat site will be provided. Prices do include any Costa Rican sales tax that may be applicable. *Note: All retreat participants will have to pay a departure tax of $29 USD at the airport in Costa Rica before returning to the U.S. Some airlines include this tax in the price of their airline tickets already. Space is usually limited to 15 participants on this wellness retreat. Room reservations are on a first-come basis. A 50% deposit fee will be charged upon receipt of your registration, and the remainder is due by 60 days before the retreat begins. If you cancel yet your spot is filled, then you will only be charged a $75 administrative fee. (Note: Your spot is considered filled once all spots are filled and there is a waiting list. Or, you can personally fill your spot by sending a replacement participant on your behalf.) If you cancel yet your spot is not filled, then you will lose your entire payment, unless you choose to apply this payment towards the following year’s wellness retreat tuition. If this wellness retreat is canceled by the host or facilitators, all participants will receive a full refund. However, any travel expenses will NOT be reimbursed. All activities during this wellness retreat are optional, but are included in the price of this wellness retreat. Some activities may be physically strenuous. It is the responsibility of each participant to use good judgment as to which activities they can safely participate in. Neither Casa Nautika, nor Dr. Samuel A. Mielcarski, is liable should you injure yourself while attending this wellness retreat. You will need to sign a liability waiver prior to attending the retreat. Retreat participants must be at least 18 years old, unless accompanied by a parent or guardian. The event hosts and facilitators are not responsible for any travel delays or inconveniences either. Please let us know if you have any type of allergies. We recommend highly “flying direct” into San Jose Int’l Airport (airport code: SJO) in Costa Rica if possible to avoid any potential travel delays or problems. *Important- Please Read! - This wellness retreat starts on March 17th. So, you will need to arrive in Costa Rica by March 16th. The wellness retreat shuttle will pick everyone up at Margarita’s Guest House (which is where we recommend you stay if possible) around 6:30am and bring you all to your first adventure. The day after the retreat, the wellness retreat shuttle will bring you back to the airport early morning March 24th. To give yourself enough time, I would recommend booking return flights home at 12:00pm noon or later. If NOT using our complimentary wellness retreat transportation that will be provided during the specific scheduled window of time we have arranged, YOU will be responsible (including expenses) for getting yourself to and from the wellness retreat location. Options include: taxis, shuttles, buses, or rental cars. Once registered for the retreat, you will be sent follow email info with a detailed list of “things to bring” with you; as well as other traveler information. If you don’t live in Costa Rica, you WILL need a passport. 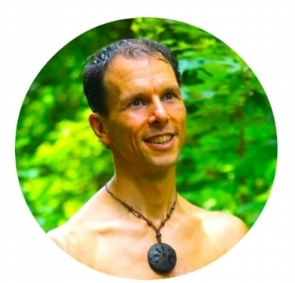 Dr. Samuel A. Mielcarski, DPT, (aka “The Health Raiser!”) is the creator and leader of the RAW-habilitation “Health Raiser” Wellness Retreats. Samuel is a licensed Physical Therapist, Speaker, and Wellness Consultant with over 21 years of clinical experience. People leave Samuel’s retreats, lectures, and private therapy sessions empowered to take charge of their health. Whether working with a group of people or just an individual, Samuel’s passion and enthusiasm are contagious. Dr. SAM is said to have ‘magic’ healing hands and a big heart. Due to his ability to get outstanding results and his passion and quest to help others, Samuel has become a highly sought after rehabilitation and wellness consultant. The guidance he provides may not only change your life, it may even save it!